My mother enrolled me in my first cooking class the summer before fourth grade. I think she did it purely to keep my mind off the cancer diagnosis (and subsequent treatment) she’d gotten over the winter, not because I showed any special proclivity or interest in cooking. I was in the throes of a rabid growth spurt that summer, so I certainly had an interest in eating, that’s for sure. My appetite seemed boundless and I remember constantly feeling roiling and empty inside. Perhaps Mama decided that a girl so stomach-centered must belong in the kitchen–a natural habitat kind of thing. The distraction worked. I loved the cooking class, and it was the first of many to follow. For years, I kept my endeavors in the kitchen fairly simple–I gravitated toward basic, straightforward recipes like sloppy joes, spaghetti, blueberry pancakes. You know–kid food. I made the food I wanted to eat and the food that was familiar. I didn’t really become adventurous in my cooking (or eating) until high school, when I became kind of obsessed with a local restaurant reviewer who called herself “The Gabby Gourmet.” She had reviews in multiple publications and even her own weekly spot on the radio, where she’d dish on the Denver dining scene and interview chefs/restauranteurs. Her real name was Pat something-or-other, but everyone around town just knew her as Gabby. I thought Gabby had the coolest gig in town. What kind of a dream career is that–being paid to eat expensive meals and try exotic cuisines and rub elbows with local celebrities? That was a job I could get behind. I read her reviews voraciously, and began clipping out reviews of restaurants that sounded particularly awesome, which I kept in a yellow Pee-Chee folder. My Daddy-o wasn’t necessarily sure if he liked this new development, because instead of choosing the local steakhouse for a special dinner out, I’d consult my folder of reviews and suggest things that were decidedly out of his comfort zone. The year I turned 15, I consulted my stack of clippings and chose a place called the T-Wa Inn for my birthday dinner. The Gabby Gourmet had given the T-Wa Inn a five-pig rating (she used pigs, not stars). “To die for!” she exclaimed. My Daddy wasn’t so sure about this. For one thing, the T-Wa Inn served Vietnamese food, and was, in fact, the first and only restaurant in Denver at the time to serve such a cuisine. He’d never heard of Vietnamese food and wasn’t really sure he wanted to try it–didn’t they eat dog or some such thing in Vietnam? And if Vietnamese food was so great, how come there was only one game in town? The restaurant was also located on South Federal Boulevard, which was in a seedy section of the city. Who wanted to get mugged going to dinner? He sighed and I got my way, and we made the pilgrimage to South Federal Boulevard on a frigid February night, driving past the pawn shops and the gun dealers to a modest little structure that looked like it was a former Pizza Hut. “Hrumph. Doesn’t look like much,” Daddy muttered. My mother was right. When we opened the door, the room was full of chopstick-weilding families and small children and faces hovering over enormous, steaming bowls of soup. Vietnamese faces. We were the only white folks in the joint and we were awkwardly overdressed and the tables were packed close together like sardines. Suddenly, I wasn’t so sure about my decision. “Welcome! Welcome!” a bird-boned, raven-haired woman smiled at us. She was impossibly tiny but her smile was genuine. “Table for four?” We nodded. I watched as skinny little Vietnamese people plucked sprouts and wedges of lime and leafy herbs from platters and swirled them into the cauldrons, smacking lips and passing condiments. I was fascinated by their dexterity; one hand held a spoon and the other wound meat and noodles around chopsticks and somehow, gracefully, the two hands came together to form the perfect slurpy bite. I was too intimidated to order the Garbage Soup, but we did order egg rolls, which didn’t seem so exotic. We’d had egg rolls with takeout Chinese before. When the waitress plopped down a delicious smelling platter of fried goodness, I was heartened, but then she plopped down a large platter of lettuce and sprouts and mint and a pungently salty bowl of sauce. I was perplexed. Why did we have salad with our egg rolls? The confusion must have registered on my face because the waitress smiled kindly. “You want I show you?” I nodded. She demonstrated how to wrap the egg roll in a leaf of lettuce, add a few sprouts and some fresh mint, dunk it in the sauce and eat it like a little garden-egg-roll-burrito. Gingerly, I tried one. It was a revelation. The fresh vegetables and punchy herbs cut the fatty goodness of the egg roll and made it better–fresher somehow. “It is good,” my mother murmured. I looked across the table at my father, who was munching earnestly. He winked. We devoured the 4 egg rolls and ordered another round. The rest of the meal was an adventure in taste, texture, technique. There were fat, juicy shrimp, which arrived skewered and grilled on strips of fresh sugar cane. Feather-light soft-shell crab, fried in delicate batter, which again, the waitress had to give us a tutorial how to eat. There were slippery rice noodles. And on my father’s plate, a meaty, lacquered pork chop that was both deeply salty and pleasantly sticky-sweet. My father, the man who rarely shares his food, took a bite of that chop and then passed it around for the rest of us to sample, because it was something special. By the time we left, the windows of the tiny restaurant were beginning to fog with steam and tables were beginning to empty and other diners, not ready to brave the cold yet, were topping cups of hot coffee with thick, condensed, sticky milk. The meal was over, but my love affair with Vietnamese food had just begun. “That was really fun, wasn’t it?” Mama said, as we made our way home. 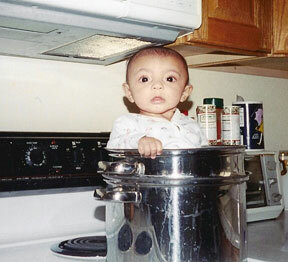 “I’m still scared of that Garbage Soup,” my sister said. It’s been thirty-plus years since that maiden voyage into Vietnamese food. In 2014, I was sad to learn that the T-Wa Inn shuttered its doors, but what a tradition and a legacy they started. With the success of the T-Wa, Vietnamese restaurants began popping up all over the Denver area, although many remain dotted down the streets of South Federal Boulevard, affectionately now-known as Vietnamese Row. It’s now their job to finish the job the T-Wa started. Happily, I can get Vietnamese food all over this great state now. Good thing, since those steaming bowls of pho (aka: Garbage Soup) are my idea of the ultimate comfort food. I enjoy all Asian cuisine, but I’d have to say that Vietnamese cuisine is the food I crave most. I love the freshness of the dishes and the balance of sweet, salty, hot, herbaceous flavors. 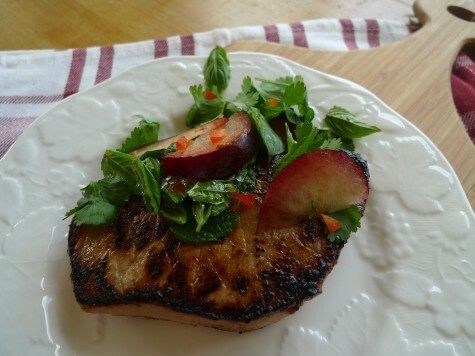 The recipe below is a nod to the pork chop my Daddy-o enjoyed on that cold February night, so many moons ago. You’ll notice a healthy amount of brown sugar in the marinade for the pork, but it balances the saltiness of the soy and fish sauce. The sugar turns into a lovely little caramel crust on the pork when you grill it. Don’t be alarmed if the crust looks a little dark–that’s the sugar talking. 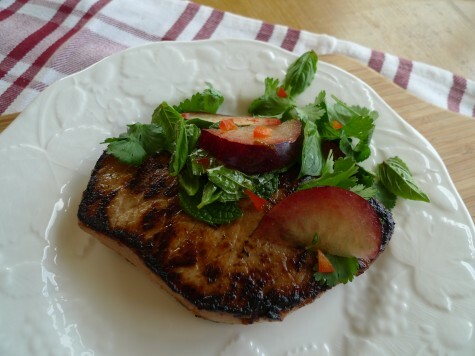 Also don’t be alarmed by the unique addition of fresh plums to the herb/chile salad served with the pork–the sweet-tart punch of the plums perfectly highlights the salty/sweet pork. If it sounds too weird for you, you can skip it and just stick to the herb salad, sans plum. I’d encourage you to give it a go, though. I wish my Mama had been alive to taste this recipe. She’d have loved it, and she would have dug into it with the same spirit of exploration and humor as she exuded the night of my 15th year. My Daddy-o is in San Francisco this week, but as soon as he returns home, I’m making this for him. No sharing necessary. Place the pork chops in a large zip-top plastic bag. In a bowl, whisk together remaining ingredients. Pour over pork, seal bag and marinate in the refrigerator at least 4 hours, turning occasionally. When ready to cook, heat a grill pan or cast-iron skillet over high heat until screaming hot. Pat pork chops dry. Grill pork 4 minutes and flip; grill 3-4 minutes more or until done. Let rest for 5 minutes. Whisk dressing ingredients and pour over herb salad. Serve on top of pork chops. This brought back my memories of T-Wa. Still miss that place but we love New Saigon. Still go to Federal at least once a month and i also remember waiting in line when I read that review. We ogled at the soft shell crabs. Anytime you want to head down, let me know. I’m always open for going Vietnamese! So excited to have a partner in Vietnamese love! I rarely make it down to S-Fed, but I’d love to have someone to nosh with!